Sleep eludes me. How annoying this is. At sea with my thoughts, at 3am, it strikes me as sensible that I write something, writing being a cathartic act after which one feels infinitely better. I travel out of Texas frequently and I must say the roads here are very, very nice for the most part. Sounds like some of you are spoiled...take a trip to some of the other states and you and your car will be glad to be back on Texas highways. With that said I do agree politics is killing our transportation department. 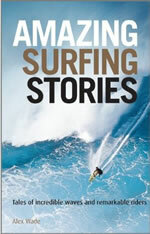 I'm writing another surf book - a collection of dramatic, inspiring, moving, strange and quirky surf stories. It's due out in November next year. If you'd like to suggest any contenders, drop me a line at alex@alexwade.com. Stories can come from anywhere in the world and can involve anyone in surfing, from legends and superstars to unknowns and people whose array of injuries prevent them from properly enjoying the wholesome pursuit of riding waves, not that this applies to me, no, far from it, my neck is as sturdy as can be, it's just annoying that I seem to have over-surfed of late (I managed an extraordinary run of nine days' surfing in ten over the recent period of moderate to small swell and offshores), so that now, as I write, spinal cord compression afflicts me and I find myself worrying about the X-Ray that I had a couple of days ago, which, to my now vaguely tutored eye, reveals a fairly dismal amount of myelopathy from discs C5 to C7, not that this gets me down, oh no, life is fine and dandy for at least, albeit that when the neck plays up like this I have an errant left leg, I am up, about and walking, to the shops, to the car, around Morrisons, around the car to put air in the tyres, elsewhere too, like along the beach with the dogs while everyone else goes for a surf. Perhaps, when I next surf, I should paddle out in a Billabong VI wetsuit? Wearing this fiendishly clever suit would mean that if the neck went wrong, so that I was paralysed, I would at least float to the surface. Well, I would if I managed to pull the suit's rip cord, but how would I be able to do this if the old spinal cord was severed and all mobility from the neck down was lost? I would have to rely on the power of my mind, on the age-old ability to make inanimate objects behave as we want them to by merely staring at them, like dogs do when they want a door to open, or food to materialise out of a recalcitrant tin of Pedigree Chum, and let's face it if it works for dogs (and it does), why shouldn't it work for me, too, beneath the ocean waves, lolling about, but then again would I really want to rise to the surface, to bob up as a myelopathic sphinx, paralysed from the neck down, dependent on someone in the line-up (if there was one) being astute to my plight and rescuing me, and thereafter dependent on, well, just about everyone for just about everything. Cervical myelopathy, it's a blast.